In a move which is certain to reignite the controversy over the proposed housing development in the shadow of the nationally important Old Oswestry Hill Fort in Shropshire, Shropshire County Council have put amended development guidelines out to consultation starting on 1 June 2015. Local campaigners from the Hands Off Old Oswestry Hill Fort [HOOOH] along with many organisations and experts from the archaeological world, including Lord Renfrew and Sir Barry Cunliffe, had hoped the site would be withdrawn from the council’s “Site Allocations and Management of Development (SAMDev) Plan”. However, the much delayed revised draft plan, which was initially expected to have been published well before the General Election, retains a proposal to develop 124 houses on the controversial site OSW004, just a few hundred meters from the scheduled site, in a position which, many experts argue, substantially damages the setting of the hill fort as well as the local environment. 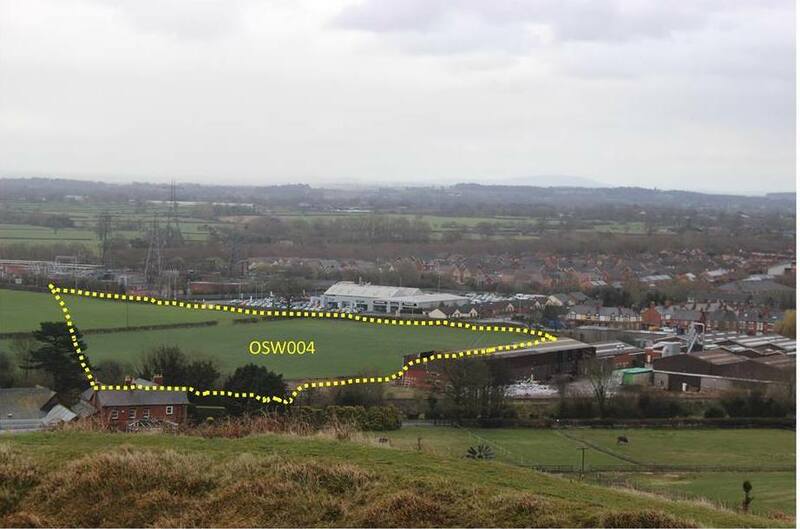 The OSW004 Site seen from Old Oswestry Hill Fort which campaigners argue shows how the infill of housing would have a substantial and harmful effect on the views to and from the scheduled site. As a result the campaigners are also angry and perplexed that the revised plan has apparently been agreed with Historic England, formerly English Heritage, subject to a series of conditions, including a full archaeological assessment, cosmetic landscaping and the preservation of certain views, which falls far short of what both local people and the independent experts consulted, either wanted or expected. The Hands Off Old Oswestry Hill Fort campaign responded to the announcement that the site remained in the SAMdev plan with a defiant promise posted on Facebook. All responses to the new planning guidelines must be placed with the Project Officer of Shropshire Council’s Planning Team by 5pm on Monday 13 July 2015. However, campaigners are also furious that the consultation is apparently only with regard to the suggested modifications to the original SAMdev document, not the actual inclusion of the Old Oswestry site itself. Meanwhile Historic England is also likely to be facing some tough questions as to why it has taken a permissive line with a development site which no-one except Shropshire Council appears to want or believe is appropriate and which many other heritage and conservation experts believe is a development too far. The campaign against site OSW004 is also supported by the Society of Antiquaries of London, The Prehistoric Society, RESCUE (British Archaeological Trust),the Campaign to Protect Rural England [CPRE], and the Shropshire Wildlife Trust as well as thousands of local people. In another unrelated move Shropshire County Council, already in hot water over the Old Oswestry plan, are to be reported to the new Minister for Communities and Local Government, Greg Clark, by Oswestry Town Council. The town council is furious after the decision to build a new branch of the Aldi supermarket chain in Old Oswestry, which also entailed the demolition of the 200 year old Toll House, was allegedly passed by unelected officers without reference to the relevant council planning committee. “The application was dealt with by officers and we were not consulted and had no opportunity to make any objection.